If we found the scenery of Theodore Roosevelt National Park stunning, and we did, it was just a warm-up for what we encountered in South Dakota’s Badlands. 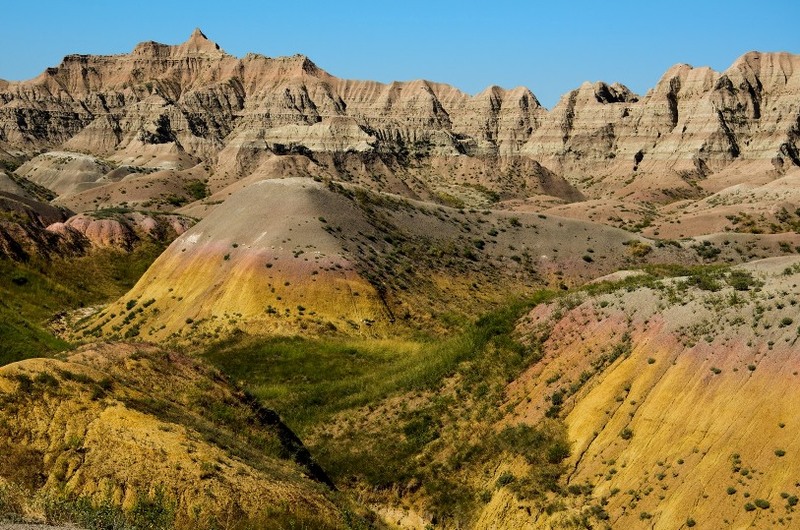 Both parks exhibit miles of twisting canyons dimpled with colorfully striated buttes; but whereas Teddy Roosevelt is mostly rounded and weathered, the Badlands remains sharp, jagged . . .
Other areas are so forbidding they might be mistaken for lunar landscapes. “Surreal” is the only way to describe the feeling of walking out on a narrow peninsula at Burn’s Basin Overlook. The ground falls away on three sides, completely out of visual range. You get the sense of floating over this amazing vista. Shannon and I both felt the same way, and we both agree that it ranks among one of our favorite travel experiences. 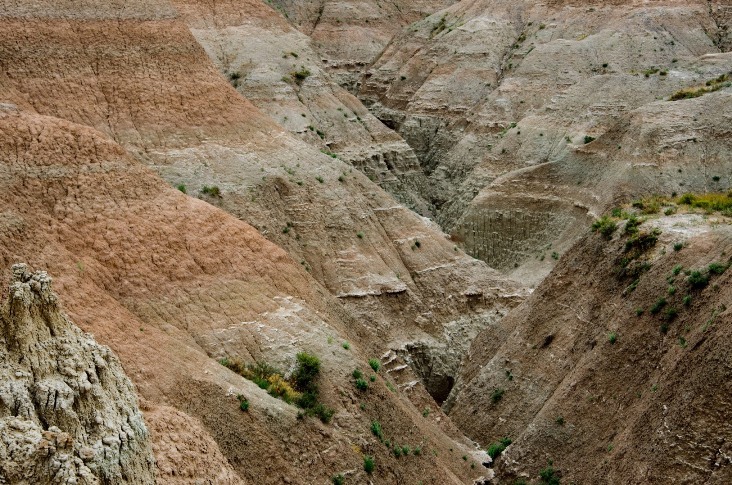 Built up over epochs through layers of different sediment and now revealed and carved by erosion, the Badlands continue to change. The park’s buttes erode at a rate of about one inch per year. 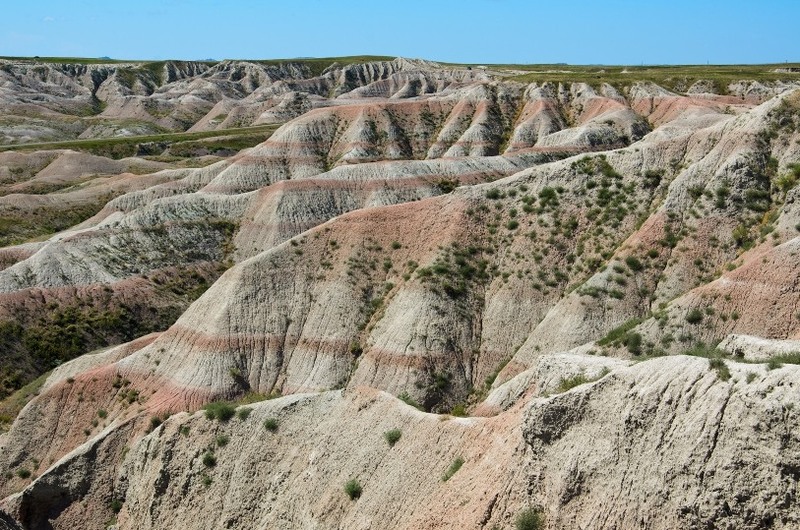 So fast that in another 500,000 year’s time the Badlands will likely completely disappear. Far below a small stream carves a winding path leaving fantastic canyons in its wake. Fortunately, that is more than enough time for lucky travelers to explore these amazing lands. But why wait? And like my experience at Bryce, if you hike down into the land formations, you get to see even more! So true. We did a fair amount of hiking. Truly awesome place. Just beautiful!! The Dakotas are 2 states we have not yet visited. In the past my wife and I have often discussed doing exactly what you guys are doing. Hmmmmm I may have to bring it up again! Wonderful! Inspiring others to get out on the road is a big reason we’re writing this blog. Glad to see we’re having an impact. I have just found your blog and think it’s great, so interesting! I haven’t travelled much myself and love reading about other peoples travels. Looking forward to reading future posts. Awesome photos. Quick question: if you could have drastically reduced your hours and time at work (say, you work 10 months, rarely more than 40 hours a week) would you be a part-time traveler? Or would that just leave you wanting more? We are lucky enough to fit in that first category. That is a good question. I definitely think I would have stuck around longer if I could have cut my hours significantly. My main complaint with my prior career is that it demanded everything. Everything was too much, so it had to go. This I why I like America so much … You have National Parks everywhere, and one is more stunning than the other. Great pictures! They are wonderful, varied, and abundant. We’re doing our best to hit most of them. We’ve yet to be disappointed. I have always wanted to see the Badlands. Thanks for sharing your photos. It gives me inspiration to plan a trip. 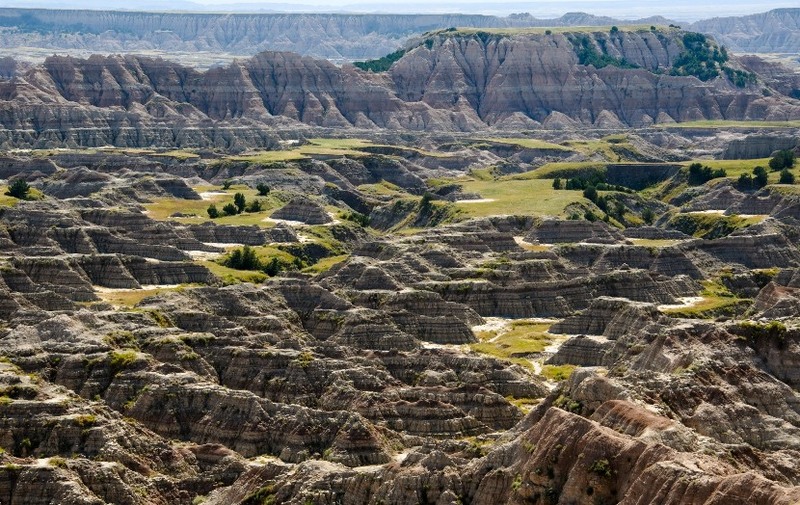 I’ve never had much desire to visit the Dakotas but after looking at these pics I’m going to reconsider. I feel like a fat kid looking at chocolate cake! Incredible photos – reminded me of the Painted Desert National Park whic I was very lucky to visit some years ago – you certainly do spectacular land formations in the States! I just discovered you blog. Looking forward to reading more. 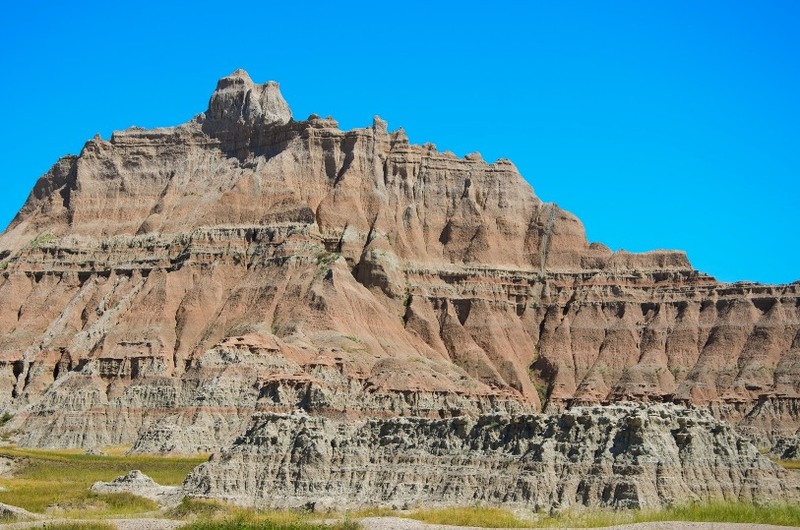 The Badlands are one of my husband’s and my favorite places to visit. We go there every time we are in SD which is our favorite state to visit. We’re glad you found us. Thanks for stopping by! 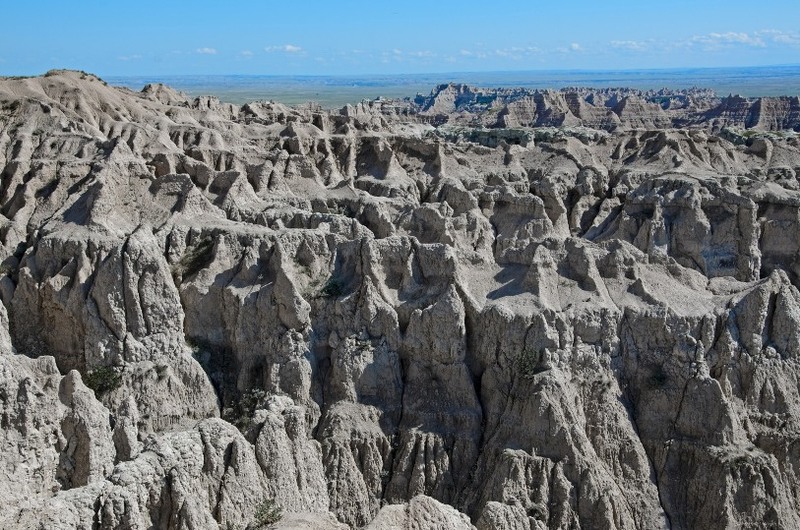 The Badlands and the Black Hills are my favorite places to visit in the US. Thanks for sharing your pictures. its amazing and mind stopping! I live in the heart of the Black Hills and if you like the outdoors at all, it is a must-visit! God’s hand was busy at work in this area and there is so much natural beauty as well as some really great man-made monuments such as Mount Rushmore and Crazy Horse Memorial! I can’t wait to visit the park next week!